Black and white negative of a photograph showing an image of Whitby looking west from the Ontario Ladies' College. St. Andrew's Presbyterian Church is visible at left. At right is the Port Whitby and Port Perry Railway station. 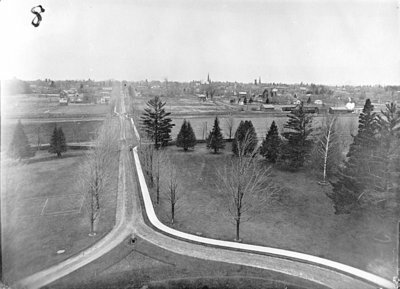 The street leading off into the distance is Gilbert Street. Looking West from Ontario Ladies' College, c.1920, James and Sons, Whitby Archives, 22-000-002.